15 April 2016, at 6:00a.m. 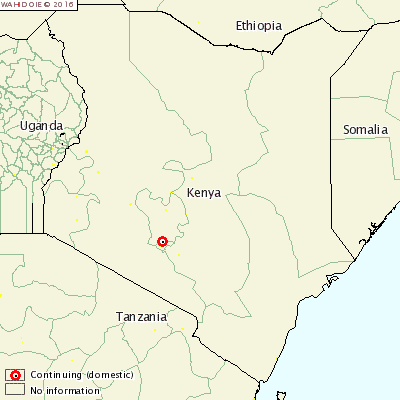 KENYA - A new outbreak of African Swine Fever (ASF) has been reported on a pig farm in central Kenya. The outbreak affected a farm in Kiamumbi. Of the 180 pigs susceptible, there were 52 cases. All 52 pigs reported with ASF died and the other 128 pigs on the farm were killed as a precaution. The affected animals were in an enclosed establishment and were fed on swill, which is thought to be the cause of the outbreak.